The students are exposed to scientific phenomena by observing a bean plant in the classroom. The students also had the opportunity to participate in a “touch and learn” science lab, allowing them to observe different physical characteristics of a frog, grasshopper, fish, and squid. First graders are ready for a year of discovery! The first quarter of the science curriculum had a strong focus on life science and exploring the world around us. 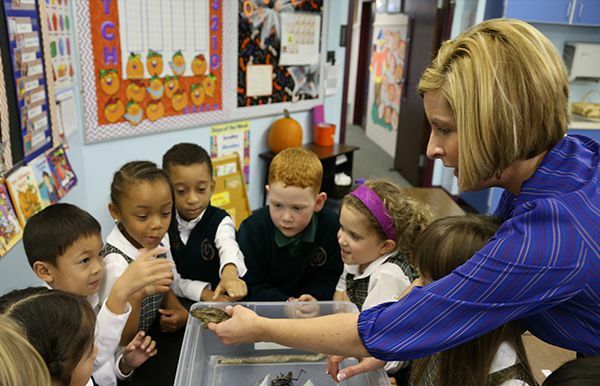 As part of their exploration, first graders observed the life cycle of a butterfly first hand in the classroom. These little insects sparked many curious conversations and science experiments! Students also studied dinosaurs and found out how we can learn about plants and animals that lived long ago by looking at their fossils. Seventh-grade science students are quickly realizing that cells, which are the individual building blocks of life forms, are truly microcosms of life itself. Each cell in one’s body can eat, breathe, reproduce, must live in a suitable environment, and has a specific function within an organism. These lessons on microbiology will translate to a deeper understanding of life science throughout the year. Students view different cell types under microscopes and use chicken eggs as models to learn how substances, both healthy and harmful, can move in and out of a cell. Eighth-grade science students recently solved a fictitious crime in chemistry class. By studying the distinct properties of an unknown purple substance that was discovered at the crime scene, students learned that testing for boiling point, sublimation, and pH are all ways to prove what an unknown substance might be. Students are mastering the periodic table to predict and conduct their own chemical reactions using burners and simple compounds from the lab. Eighth graders were also given the opportunity to view and draw spectral lines emitted from various gases to learn how each of the many elements releases photons of light in different ways to create the magnificent colors around us.